As you all know, the movie Champions (original title: “Campeones”) won the award for Best Film at the Goya Awards, along with other prizes: Best Actor went to Jesús Vidal for his role –he also blessed us with a memorable speech– and Best Original Song to Coque Malla. Now let’s dive right into Javier Fesser’s work, imbued as it is with the essence of our island. David Marqués—director and screenwriter born in Valencia but raised in Sant Antoni—is the architect of the original script of this movie, which has earned him the recognition and gratitude of experts and viewers after bringing to life such a beautiful story. Champions has given visibility to a group who already had it, but this time without sugar-coating it or being overly sentimental; it’s a movie that respects and showcases the talent of a group of people who rarely have the opportunity to excel on the big screen. Champions connects with a general sensibility that sees and appreciates people who are portrayed as they really are. 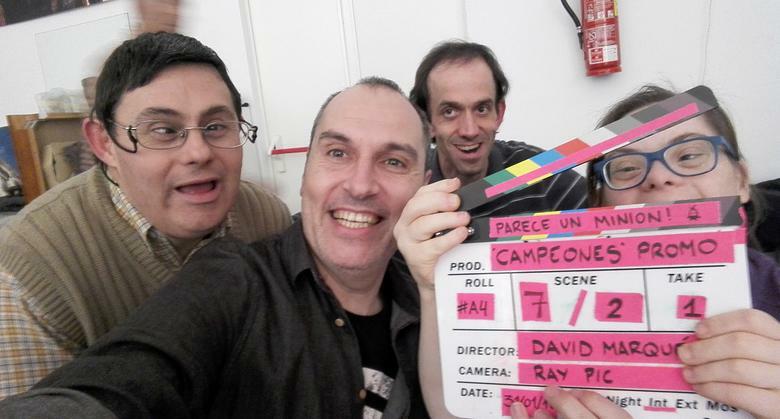 The script is based on the story of a basketball team from Aderes de Burjassot (Valencia), made up of people with mental disabilities that won two Spanish tournaments between 1999 and 2014 in its category. Marqués read this news in the paper and it caught his eye. He then met the team and the coach, Osvaldo Márquez, who shared with him many anecdotes that would later become part of the film’s script. 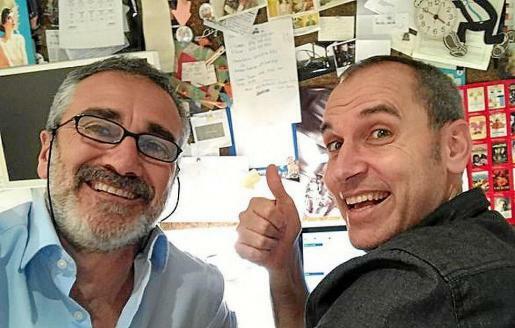 As Marqués has stated on various occasions, he’d had this idea in mind for 5 years together with a film production company from Valencia, Nadie es Perfecto, which he had worked with in the past on other projects such as Dioses y perros and En fuera de juego. Due to different reasons, the project was delayed, and the script was taken to Madrid. This is how it ended up in the hands of Pendelton, the production company of Javier Fesser, who called Marqués straightaway to get the project started under the guidance of the talented director. Marqués doesn’t regret trusting Fesser with his project as he has treated it with respect throughout the process. David has said on various occasions that he is an admirer of Fesser’s work, and from that moment onwards they decided to work together on the final script—the backbone of the film. Champions begins telling the story of Marco Montes, the character played by Javier Gutiérrez. The main character is dealing with a series of professional and personal dilemmas, and after he is fired from his position as coach of a basketball team, he has a car accident while driving intoxicated and he gets a serious fine. Marcos must then choose between spending 2 years in jail or doing 90 days of community service training a basketball team called Los Amigos made up of people with different disabilities. At first, the main character doesn’t cope very well with the news, but in time he realizes that there’s much to be learnt from the players. Champions shows us a world that is often misunderstood, a reality that we observe from the outside. The film brings us closer to people towards whom we would usually feel sympathy. However, that isn’t the message that this story tries to convey. This film goes far beyond that: it’s 140 minutes of smiles, hard work, emotional intelligence, warmth, willpower and lots of love. It offers a life lesson to the audience, helping us understand and see things from another perspective. By enjoying this film, we get to free ourselves from stereotypes and it allows us to approach disabilities differently, in a more natural and normal way. It shows us that we are all different in one way or another, using humour to make us roar with laughter and leaving out drama or pity. Champions marks a turning point: it re-educates us as a society and teaches us why it’s important to experience this reality directly. By living through these experiences, we see how important it is to integrate people with special needs immediately and much more broadly than we do now. People such as Paquito, Fabián or Collantes have lots to offer and teach us, starting with their emotional intelligence evidenced in each unselfish gesture of gratitude they make. It’s no mystery why it’s been the biggest Spanish movie of the year at the box office, with more than 3.5 million viewers and making a whopping 20 million euros to date. Moreover, as you undoubtedly know, it was chosen by the Spanish Cinema Academy to represent Spain at the Oscars and has already won many awards, including the Forqué Prize for Best Fiction Feature Film, the Award for Education and Values in Cinema, Feroz Prize for Best Comedy Film and three out of the 11 nominations for the Goya Awards previously mentioned. We are thankful that David Marqués has been the architect of such an overwhelmingly joyful story that awakens so many emotions. He stated that the making of the script made him feel very humble when approaching two worlds that to him were unknown: intellectual disabilities and basketball. Marqués stated on many occasions that he didn’t want his stories to in any way seem patronizing or condescending, developing the plot from the very beginning with lots of respect for its characters. David also has stated that the actors were chosen from 600 boys and girls and that they had to partially rewrite the dialogue to adapt it to the characteristics of each person, but without avoiding spontaneous improvisation while filming. For the Ibizan screenwriter and director, Champions is a lesson for those who think they are free from any type of disability: we all have some sort of emotional flaw even though it’s not diagnosed. As regards to working alongside an actor like Javier Gutiérrez, he only feels admiration and emphasizes that the actor does a brilliant job along with the rest of the cast. Thanks to his Goya nomination for Best Original Script and the overall success of Champions, David already has some new projects in sight which he’ll keep us posted on. We want to sincerely thank him for writing this story and for pulling it off so well. We strongly recommend that you watch this film. If you haven’t yet, it’s a treasure filled with joy and human spirit. It’s crystal clear to us that the title of this film is 100% accurate: in life and on the court… they’re true Champions!